This week, we deliver to all Early Summer Vegetable, Fruit and Egg Share members. Late Summer Share Registration Closes Soon! 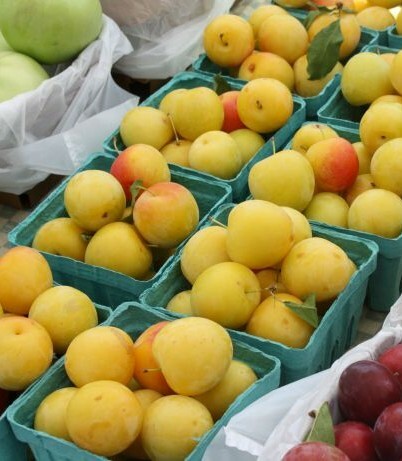 - Late Summer Vegetable,Fruit and Egg Shares begin the week of August 20th. Shares are nearly sold out, so please register for your share of the farm today. Thank you for supporting local, family farming! "What's been the best and the worst parts of our season so far?" was a recent question I posed to our farm crew at a recent lunch together. "The worst part was what happened to our tomatoes," said many of the crew members. "The best part was replanting our tomatoes and the hope for our tomato crop again." We all nod in agreement. Our tomato crop, one of our most important and beloved crops, struggled this season and, admittedly, its been quite an experience for us all. Just over one month ago, Jeff and I were doing our usual field reviews on a Sunday and we both noticed something strange with our tomato plants. They were wilting and seemed dry. Dry? We had received record rainfalls within the past couple of months, and even though our ground dries out with sunshine and wind, our clay-based soils hold moisture for weeks. This seemed strange. Jeff took our management team into the field first thing Monday morning as a investigative search party of sorts. This experienced team spent an hour or so scouring the plants and soils, looking for clues and finally, they discovered something. 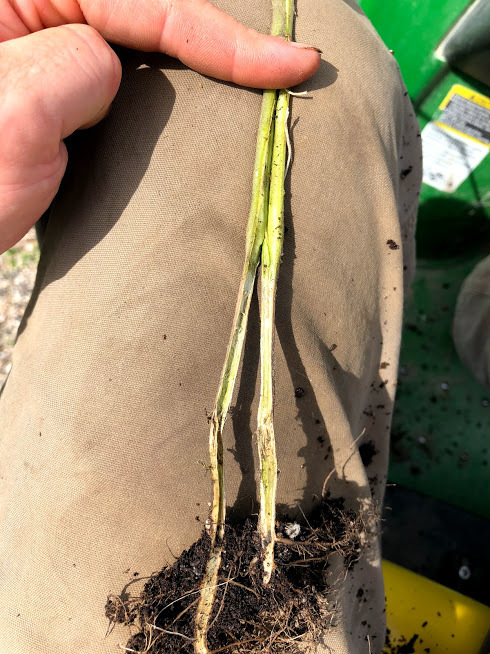 The plant stems were rotting at the soil level causing damage to the vascular system and not allowing the roots to move water and nutrients to the to top of the the plant. Without the stems to transport water and nutrients, the plants were dying quickly. Jeff and I urgently pulled together a plan. Jeff spoke with University of Illinois plant pathologists, took tissue samples and overnighted these samples to the Plant Lab to diagnosis the disease. In the meantime, Jeff and our management re-planned and decided to prepare another field for replanting before the next rainfall predicted for Monday night. With multiple tractors and team members on-hand, the team set to work to making raised beds, preparing new irrigation and re-laying mulch, assuming we could find organic tomato seedlings. I spent hours calling fellow organic farmers, growers in Michigan, Wisconsin and Illinois, to locate new organic seedlings. 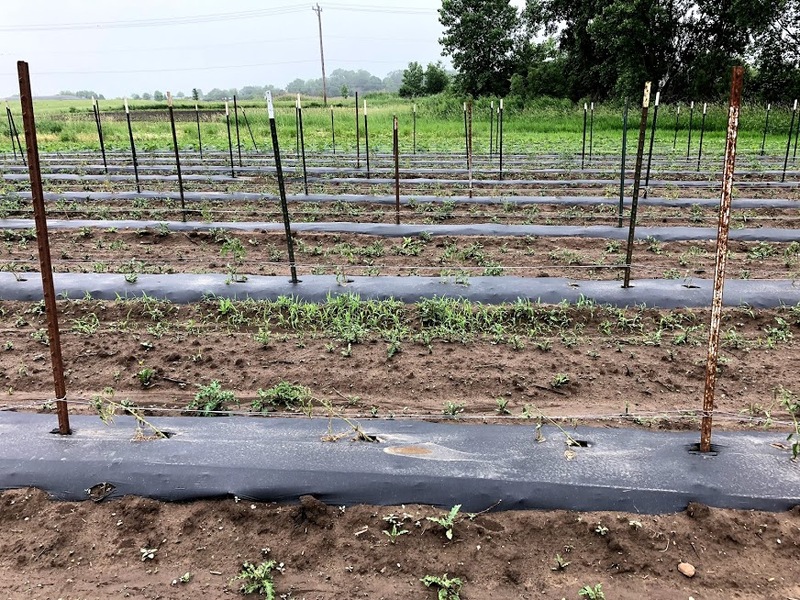 We hoped for the same mix of tomatoes we grow (plenty of heirlooms, beefsteaks, romas and cherry tomatoes) but we couldn't be picky at this point -- most farmers had their tomato plants in the ground or already sold their tomato plants. That said, the farmers we know are a generous bunch. Every farmer who couldn't help us directly put us in touch with a friend of theirs who could (and offered to help us in other ways, too). Between farmer friends, friends of friends, neighbors, we rounded up over a thousand organic tomato seedings at our farm on Wednesday morning. We were humbled and recharged to move forward. Meanwhile, the tests came back: our tomatoes were dying because of pythium stem rot. 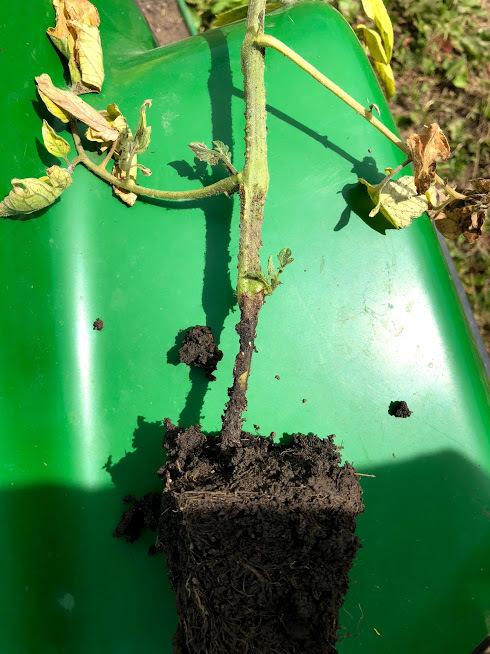 The pythium fungus exists in most soils, but only thrives under a specific combination of moisture and temperature conditions at planting time. Those conditions occured this spring. Pythium is a disease which usually appears in tropical environments, not in our region. Within our 12+ years of farm records, there was no record of an outbreak of this disease on the Prairie Crossing Farm. 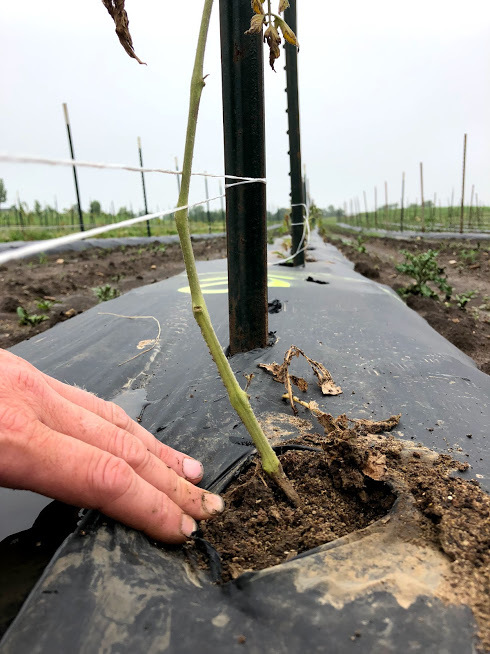 But we soon learned that other farmers in our region experienced the same sequence of shocking, quick crop failure on their farms as a result of pythium. 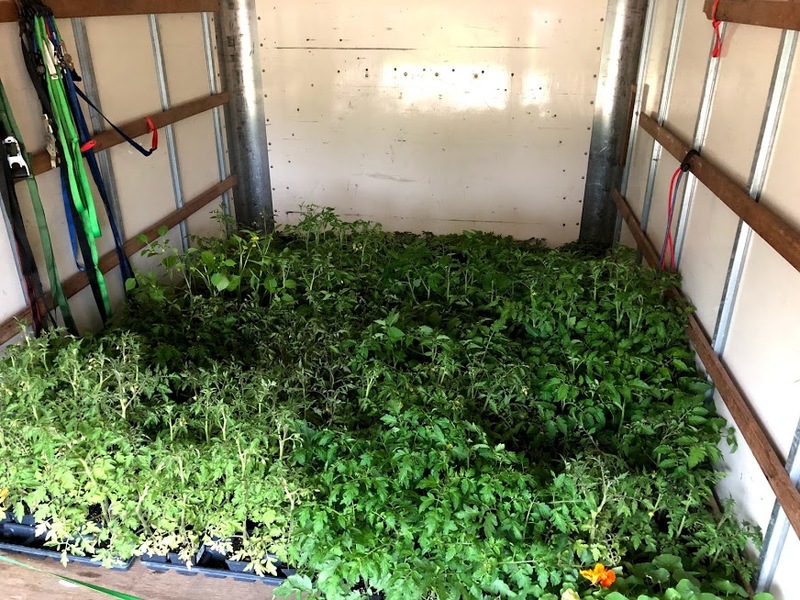 During the days and weeks to follow, the team planted the large tomato plants and repotted small tomato plants in our greenhouse to promote healthy growth before planting. 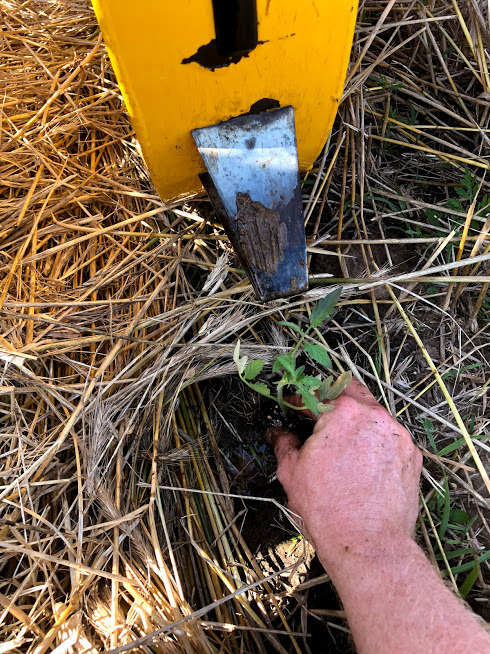 The team re-pounded the tomato posts and re-trellised the tomato plants. 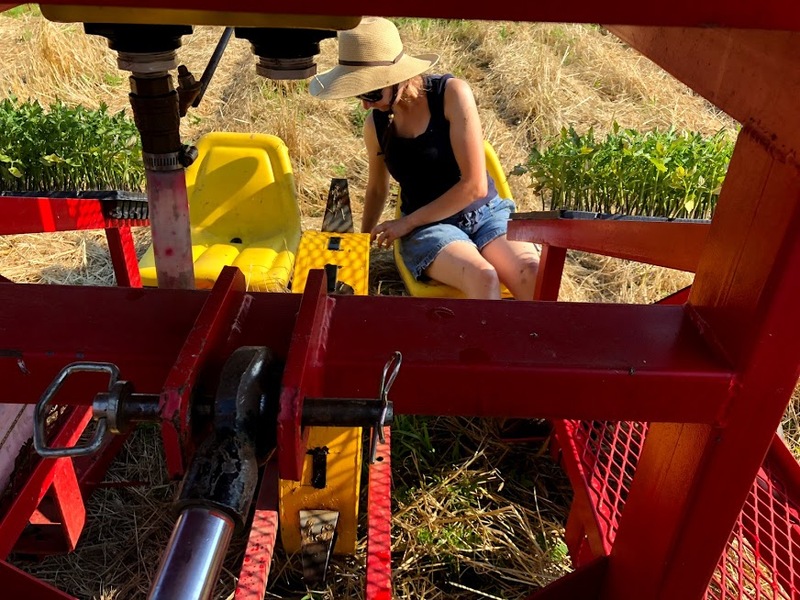 We spent the fourth of July planting some of the tomatoes into crimped rye to experiment with tomatoes planted into a no-till natural, protective mulch. Soon, our fields were again filled with beautiful, hopeful tomato plants. The wonderful news is that our hoophouse tomatoes remained in perfect condition throughout, and the tomatoes in your shares this week include this bountiful harvest! These hoophouse tomatoes are the best we've ever grown there, with the many of the plants reaching nearly 8 feet tall already, filled with ripening fruit. We all smiled as we brought in a beautiful harvest from these plants yesterday. We cannot not wait to share with you! While this year's tomato harvest from the field may be later than expected, we're hopeful. The plants are looking healthy, the weather is warm and there's plenty of sunshine. Looking back, this experience reminded us of the importance of building resilience. Resilience is not important to build into our soils, farming systems and our ecosystem but also into ourselves. 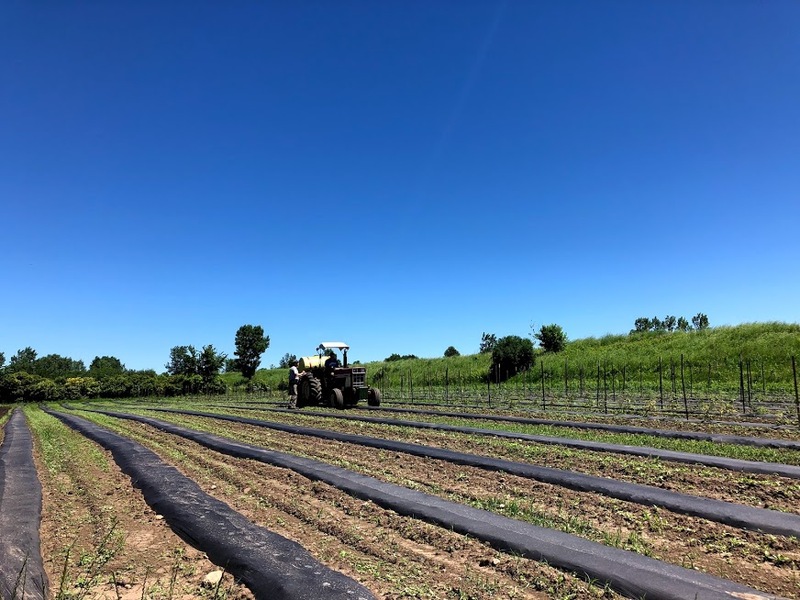 To quote a great article that I read recently about resilient farmers and the support of community: "That’s the beauty of CSA: passionate, pragmatic farmers growing high-quality food with the community right by their side, supporting each other along the way." We're grateful for your support in building a more resilient food system. This week's vegetable shares will also receive cantaloupe. We include in vegetable shares because melons grow on vines like many other cucurbit crops (e.g., zucchini, cucumbers) and typically grown by vegetable growers. 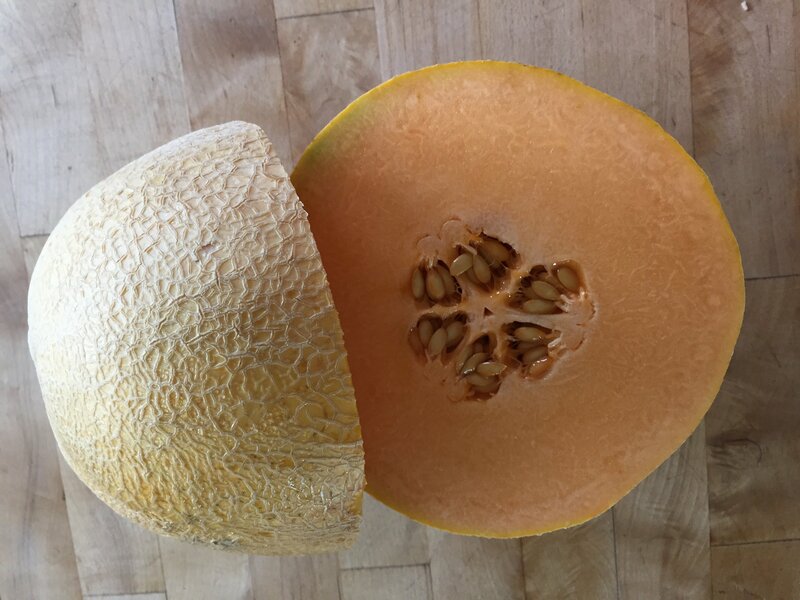 This week's melons are grown by Steve Pincus and Beth Kazmar of Tipi Produce, who grow 45 acres of certified organic crops in Evansville, WI. 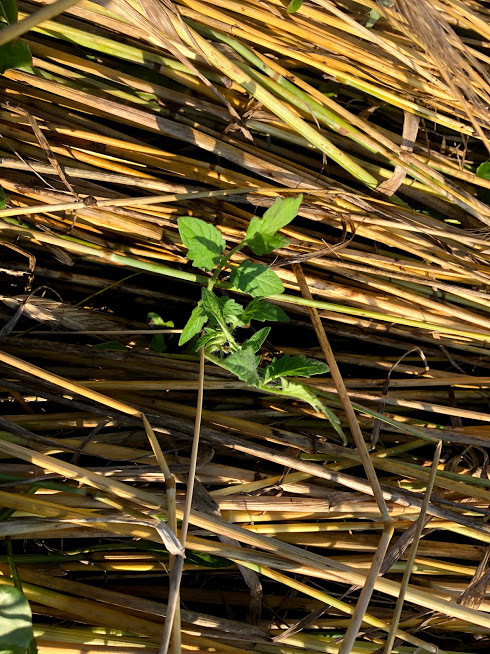 They are interested in understanding the biology of their 45 crops so they can grow them better, using cover crops, rotten leaves and composted manures as natural fertilizers. We've known Steve for many years, and we always enjoy visiting his beautiful farm when we're in Wisconsin. 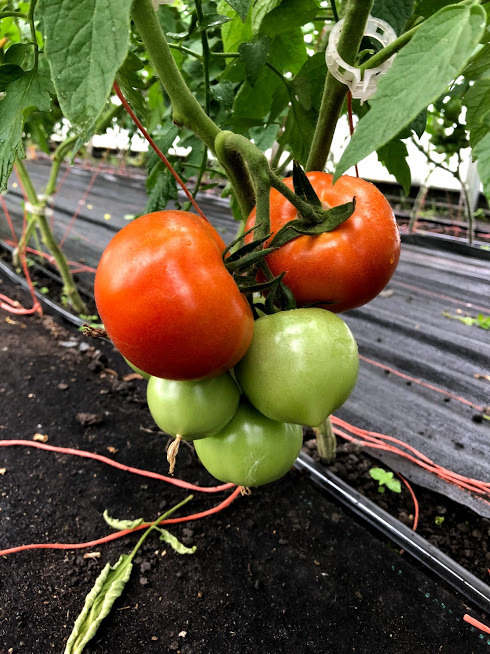 We grow a variety of tomatoes in the hoophouse soils including traditional beefsteak tomatoes and heirloom tomatoes which in many different shapes and sizes. Both types are flavorful and members receive both throughout the growing season. Heirloom tomatoes flavors are as varied as their colors; some are rich, some are tart, some smooth, etc. 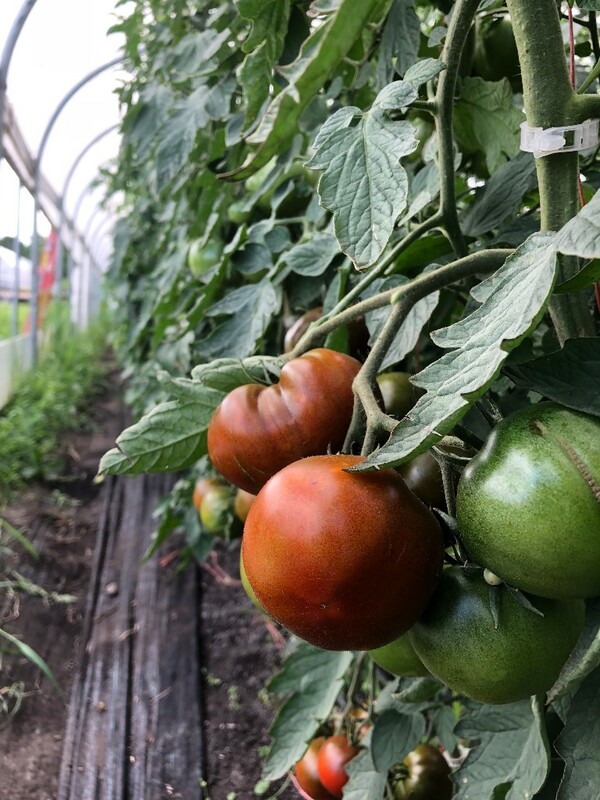 We love heirlooms for their varied looks, flavors and that growing heirloom tomatoes is a great way to promote diversity in the tomato gene pool. Sauté sliced plums or tart cherries and serve alongside grilled meat or poultry. Toss sliced plums in a salad with arugula, red onion, and crisp bacon. For a dessert, poach halved plums in red wine or port along with cinnamon, orange zest, sugar, and a touch of pepper. Add diced plums or tart cherries to muffins, quick breads, and pancake batter. Whisk honey, black pepper, and 1 cup boiling water in a 9" x 13" baking dish; allow to cool. Add cantaloupe; toss to coat. Cover with plastic wrap and refrigerate at least 4 hours or up to overnight. Drain and discard excess syrup from cantaloupe. Sprinkle with thinly sliced basil and salt. Serves 6. Position 1 rack in top third of oven and 1 rack in bottom third of oven; preheat to 425°F. Unroll pizza dough and place on heavy large baking sheet. Press or stretch to 13x9-inch rectangle. Brush with 1 tablespoon oil. Toss tomatoes, bell pepper, zucchini, and onion with remaining 3 tablespoons oil in large bowl. Arrange vegetables on large rimmed baking sheet. Place pizza crust on top rack in oven and vegetables on bottom rack. Bake until pizza crust is golden brown and vegetables are softened and brown in spots, about 13 minutes. Remove from oven. Sprinkle crust with cheese and top with vegetables. Top with basil and bake until cheese is melted and bubbly, about 3 minutes. Cut into squares and serve. Serves 4. Next Week's Harvest (our best guess)... cilantro, kohlrabi, peaches, eggplant, peppers, plums, onions and more!